The seat of the French monarchy from the late 17th through the 18th century, Versailles was originally a hunting lodge. But Louis XIV had bigger plans, expanding the lodge tremendously eventually becoming the official French court in 1677. A dramatic example of Baroque architecture, the building has more than 700 windows. The surrounding gardens boast 1,500 fountains and more than 300 statues. 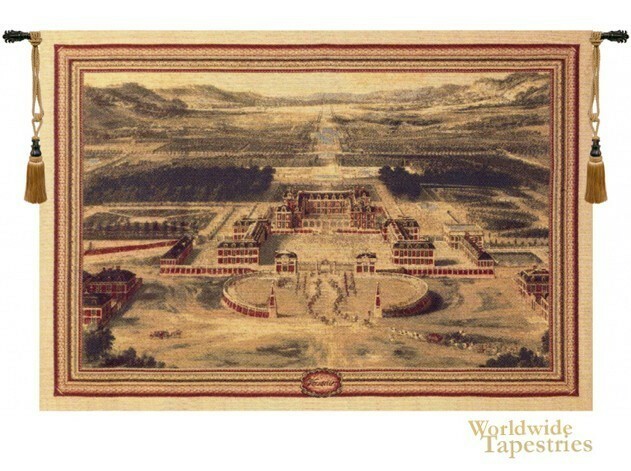 This wonderful view of Versailles in Versailles I tapestry is from above, giving one a great sense of the actual size of the palace and the grounds. With its magnificent design, this tapestry is simply outstanding in its detail and scenic vista. It truly captures a time when kings were the masters of their domains as well as their realms. This Chenille Versailles tapestry is unlined and comes with a tunnel for easy hanging. Note: Tapestry rod and tassels, where pictured, are not included in the price. Dimensions: W 72" x H 52"